Maria Bell and Andra Fry presented the SADL project at the 2015 Association of Librarians and Information Professionals in the Social Sciences AGM Conference. Jane Secker presented at this conference about the Student Ambassadors for Digital Literacy project at LSE. Jane Secker and Arun Karnad presented an abstract titled Putting Students in the SADL: Creating a Student Network for Digital Literacy on 8 July at the University of Greenwich. Jane Secker and Arun Karnad presented the findings of the SADL project at the HEA Annual Conference on 3 July. The presentation was titled Putting Students in the SADL: creating a student network for digital literacy. 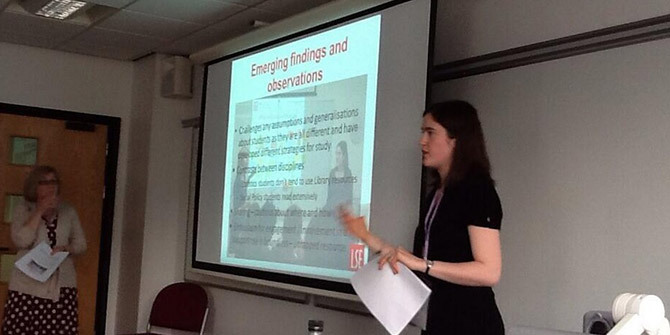 Jane Secker and Ellen Wilkinson run a workshop entitled “Ensuring LSE undergraduates gallop to success: emerging findings from the Student Ambassadors in Digital Literacy (SADL) Project” at the Academic and Research Libraries Group Conference in June . During this workshop, the SADL project team will discuss how this exciting project originated and developed, the challenges and successes as it progressed, and most importantly what was learned from closer working with undergraduate students. The content of the workshops, the discoveries and how this valuable information has been used to inform the development of the skills teaching at LSE will be explored. Maria Bell and Ellen Wilkinson gave a ten minute presentation on the SADL project at the London LibTeachMeet at King’s College, London on 12th June. Jane Secker and Maria Bell gave the keynote presentation titled Putting Students in the SADL: enhancing digital literacy at LSE at the Changing the Learning Landscape – Digital Literacy event on 7 May. Rosie Coleman, Arun Karnad, Seow Wei Chin and Djelila Delior also gave a brief presentation on the student experience of participating in the SADL project, and what they have gained by becoming Student Ambassadors for Digital Literacy. Maria Bell and Ellen Wilkinson presented a paper on the project titled “SADL up: putting students in the driving seat for digital literacy” at the Librarians’ Information Literacy Annual Conference in April. The paper reported on how the project created a student ambassador network, and let students contribute to the development of resources that are fit for purpose and in the advocacy of IL skills to their peers. Jane Secker and Arun Karnad presented a poster at this conference, outlining the aims and objectives of the LSE SADL project. The presentation generated interest from several delegates at the conference, who were interested in knowing how they could implement a similar project at their own institutions.